"You should enjoy your wedding day as much as your guests, so be prepared and leave nothing to chance." A wedding represents months of painstaking preparation and significant investment to make everything just right. 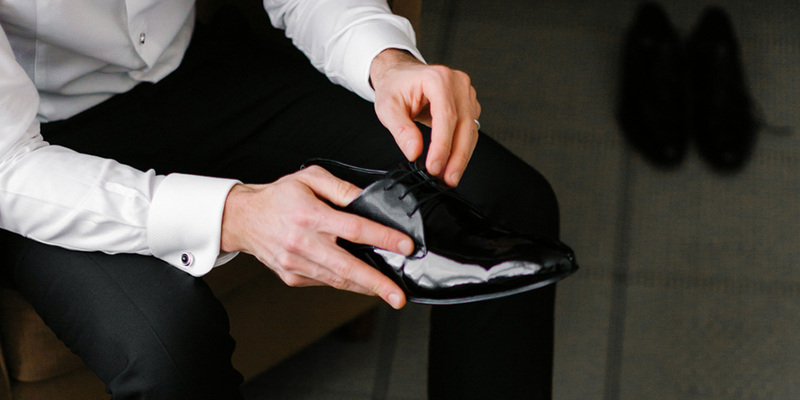 While there’s less emphasis on the day for a gentleman's preparation, every groom should plan ahead so he can tackle anything the morning might throw at him. 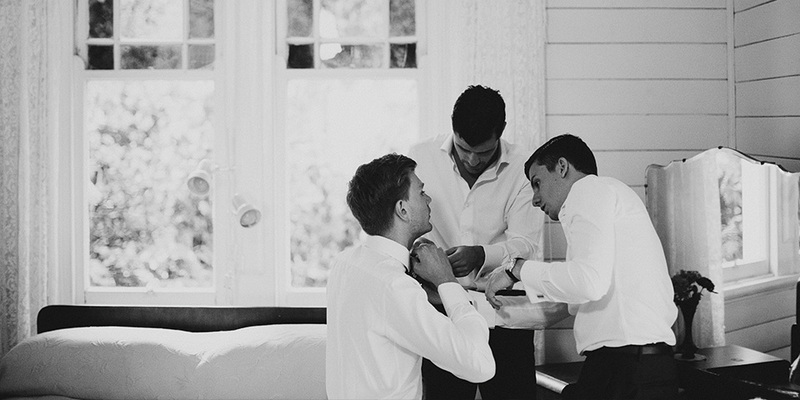 As you’ll spend the entire day in your wedding suit it needs to look immaculate from the get-go. If it’s new, it’s probably pressed and ready, or if it’s one of your favourites, it might need some attention. If you plan on wearing a suit you’ve owned a while, send it out for cleaning at least a week out from the wedding and hang it in your wardrobe after removing the plastic garment protector. Whether brand new or an old favourite, hang your suit outside the wardrobe the night before so any creases drop out. Pay particular attention to the trousers: they should hang straight on the hanger with the seams aligned. Feel free to place the trousers on a separate hanger to the blazer for guaranteed razor-sharp perfection. Well before your wedding day you should master two of the most crucial skills: bow-tie tying and pocket-square folding. While neither proposition is unachievable, inexperience can be the undoing of grooms and their groomsmen. Learning to tie a bow tie can be a steep learning curve, though, once learnt, it’s like tying a shoelace: it becomes instinctive. By practicing for the weeks before the wedding one can perfect the bow tie knot. Likewise pocket squares; try out various options while your blazer is hanging and decide which you prefer. 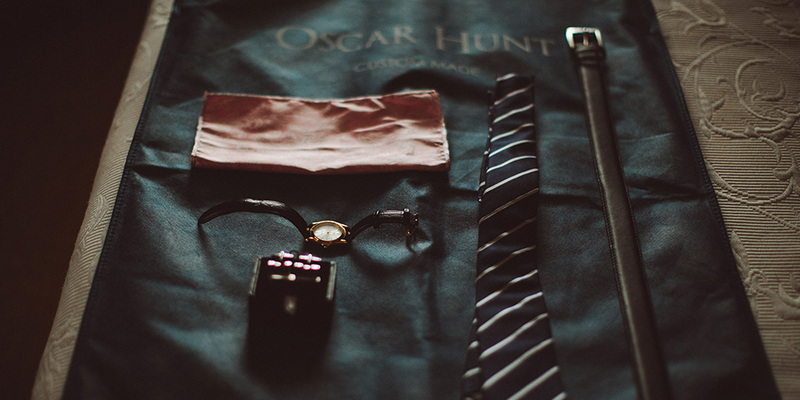 Once the wedding day arrives you’ll be equipped to tie, fold and assist any groomsman who might struggle. Always break in new shoes before the big day to avoid blisters, slipping on the dance floor and all other forms of general discomfort. Wearing shoes with thicker socks around the house for a week protects your feet and stretches the leather for comfort come showtime. Scoring leather soles with a knife might seem like sacrilege, but it will keep you vertical and will disappear with wear. A boutonnière is an elegant addition to any wedding outfit and is a simple way to tie together the theme of both groomsmen and bridesmaids. A single flower wound with ribbon and placed on the lapel makes a sophisticated statement, but you should have a dry run before the big day. While it’s tempting to slot it through the buttonhole sewn into the lapel, this tailoring throwback serves only as decoration. It’s much simpler than it looks; attach it by holding it the left lapel and securing it by pushing a pin through it from the back. Pro tip: push the boutonnière up as you pin it so it sits in the perfect position. You should enjoy your wedding day as much as your guests, so be prepared and leave nothing to chance. One final recommendation: consider ironing a backup shirt to avoid any final mishaps. Coffee on white shirts is the enemy.